This Corpse Bride Warner Bros American animated fantasy musical movie film t-shirt features Runaway Groom. Based on the classic movie, a must for any fan!! 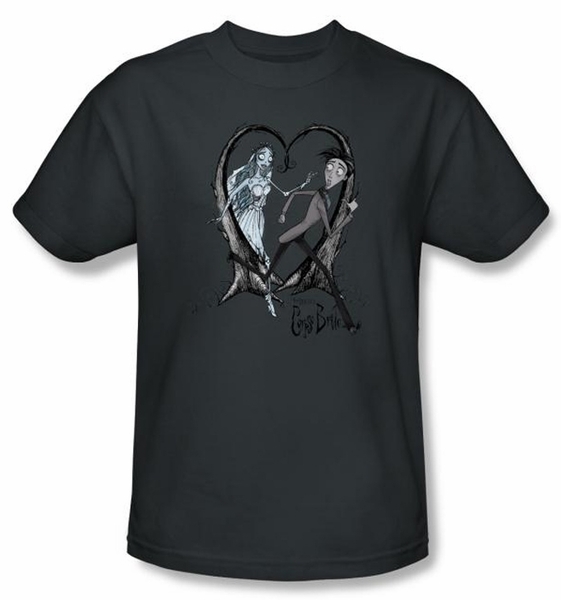 Our Corpse Bride tee shirt is an incredible t-shirt for any true Corpse Bride movie fan. This movie is about Set in a 19th century European village, this stop-motion, animated feature follows the story of Victor a young man who is whisked away to the underworld and wed to a mysterious Corpse Bride, while his real bride, Victoria, waits bereft in the land of the living. Though life in the Land of the Dead proves to be a lot more colorful than his strict Victorian upbringing, Victor learns that there is nothing in this world, or the next, that can keep him away from his one true love.